Buttery, simple, soft, and pretty. 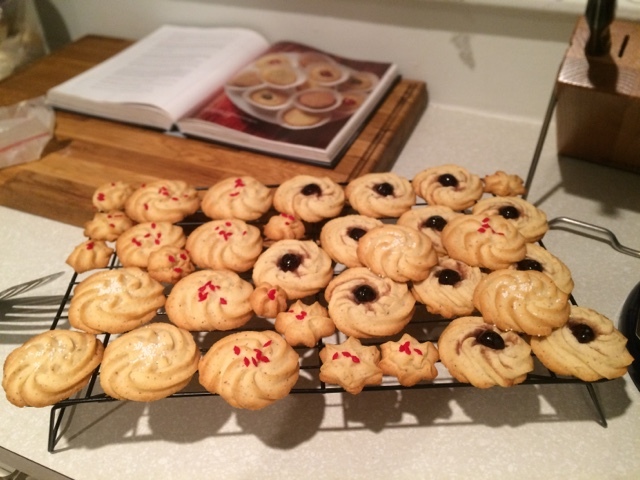 Rose's Spritz Butter Cookie recipe, with just the right touch of almond and softening cornstarch, is always reliably excellent. I've always wanted to mess with the flavoring on these a bit, so if I make them again this season I'll do that, but for now their basic reliability, style, and deliciousness will do. 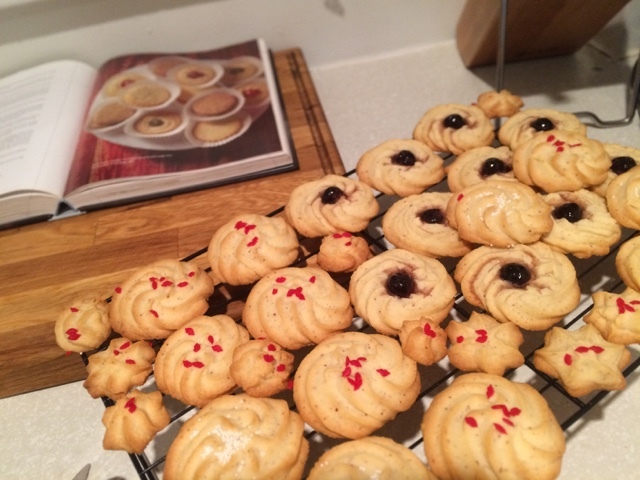 I didn't have any Jelly Tots, which one Alpha Baker used instead of glace cherries, so I used some fairly fancy and expensive Luxardo cherries, and they were...very good. Finally, these long-keeping cookies rewarded me with one more amusement, filed in the 'toddlers have no skills at all' category, as I watched my friend's two year old son attempt to eat one face on, aiming his teeth directly at the center of the cookie rather than going in from the edge. These are the jokes, people. You really got the cookie press skills down pat! They all look beautiful. I would say learning to eat one of these cookies is a most essential life skill for a toddler!